INITION is a multidisciplinary production company specialising in producing installation-based experiences that harness emerging technologies with creative rigour. Challenge: Evotec, a drug discovery solutions company, needed a replacement for its passive duality stereoscopic projection system that could present complex shapes, such as molecules in 3D, and switch easily from 2D to 3D presentations. 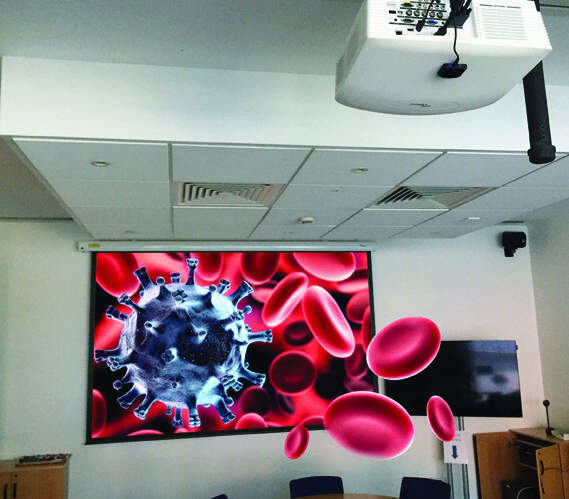 Solution: INITION installed an Optoma ProScene EH505 Projector with standard lens, a 123” electric screen and a workstation with Quadro Graphics, cabling and connectivity. Evotec, a drug discovery solutions company, needed a replacement for its passive duality stereoscopic projection system. The company often needs to present complex shapes such as molecules in 3D and wanted a single projector set-up that could easily switch from 2D to 3D presentations. The boardroom is large, so a large screen is needed and the replacement system needed to be bright as they team would rather keep the room light without closing blinds. 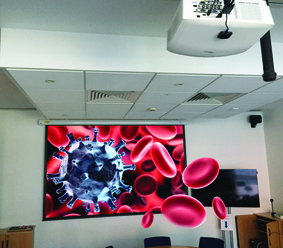 INITION installed an Optoma ProScene EH505 projector with a standard lens, a 123” electric screen and a workstation with Quadro Graphics, cabling and connectivity. 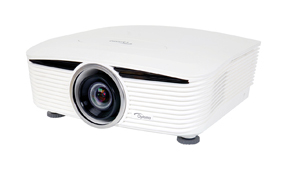 This Full 3D 5,000-lumen projector with WUXGA resolution and powerful image blending tools delivers spectacular image quality and outstanding brightness – ideal for the large, light boardroom. It has multiple lens options, with zoom and focus adjustment to get the exact image size needed, while the wide lens shift range gets the image exactly where it is wanted. This combination of zoom, lens shift and choice of lens ensured that installation was straightforward, enabling the company to use the existing ceiling fixings and reduce the time needed for installation. The EH505 is designed for medical professionals and includes a special DICOM simulation mode that has been specifically tuned for viewing greyscale images, X-rays and scans. The new system provides the bright, pin-sharp imagery needed for client meetings and allows staff at Evotec to easily swap from 2D to 3D using the remote control. Turning on the projector triggers the screen to descend, and retract when the projector is turned off. EH505 projector with a standard lens, DE-1123EGA Electric Screen, workstation with Quadro Graphics.